Ghanaian Kwesi Nyantakyi has been re-elected unopposed as West African Football Union (Wafu Zone B) president for a two-year term in office. 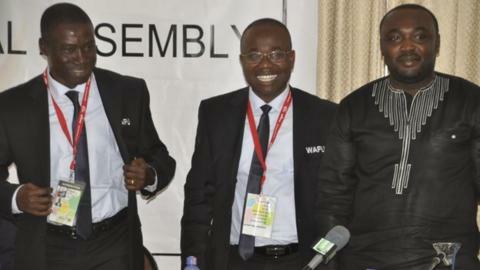 The 44-year-old, who is the president of the Ghana Football Association, was the sole candidate for the post at the election in Kumasi on Wednesday during the Wafu B Congress. His term of office will be extended to four years during congress next year if a proposal to extend the term of office of the president is approved. All the executives including Theodore Sawaduga of Burkina Faso and Nigeria's Aminu Maigari retained their places as vice-presidents of Wafu Zone B while Togolese Gabriel Ameyi won the position of the third vice-president. Nyantakyi, who was applauded by delegates at the Wafu congress for helping to revive the competitions in the region, promised more tournaments from next year and courses for coaches as well as referees in the sub-region. This comes as the final of the GOtv Wafu Nations Cup will be held in Kumasi on Thursday between hosts Ghana and Senegal. The competition has been revived thanks to a three-year sponsorship deal from South African broadcaster SuperSport worth $200,000 per year. "I am happy to inform delegates that our annual Wafu competitions have come to stay. In spite of our limited financial resources we are determined to making it successful every year," Nyantakyi told delegates. "We have negotiated a sponsorship agreement with SuperSport to cover the Wafu Cup for the next three years. "Under the agreement SuperSport will pay Wafu an annual fee of $200,000 to organize two competitions - a Nations Cup competition and a clubs championship. "The Wafu Nations Cup will be dedicated to competitions for the senior teams for men and women and the youth or age group competitions. "The clubs championships will look at developing club football in the sub region. Alongside these competitions, we will undertake clinics for coaches and referees." Meanwhile, the Wafu congress approved a petition to be sent to Fifa to urge the world governing body to increase the number of African countries at the World Cup. The congress also unanimously resolved to support Ivory Coast's bid to host the 2019 or 2021 Africa Cup of Nations.